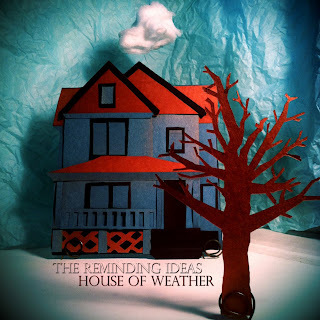 Michael Magnum and Matt Soule of The Reminding Ideas will be releasing their debut album House of Weather October 18, 2011 on Orangehand Records. These two gentlemen started the Reminding Ideas as a solution to the plaguing idea of writing songs to please others, whether it be labels, bookers, critics, and whoever became a barrier of creativity to Magnum and Soule. House of Weather is a result of these two gentlemen making music that pushed their boundaries creatively and to make music that satisfied them. but they also intended for their debut to mean something personal and different to each listener. Matt Soule describes, "Ultimately it's about the Universe, and emotions in the universe. What those emotions are is up to you. It's up to what you hear and how you interpret that. There are parts of the album where it may seem that we think that nothing is going to go well. Rest assured, everything is going to be all right." As a whole the House of Weather is a good effort to be avant-garde with their unique and experimental song structures incorporated with electronic tidbits, layered vocals, classical and hymnal elements. Although, Magnum and Soule pushed their creative boundaries and showcased their experimental efforts and capabilities to stand out I feel it isn't shiny enough for the general population to notice and listen over and over again. "Good Clown, Bad Clown", "This is Where We Breathe" and ""Save the New Day" are good tracks that highlight this debut with experimental compositions and audio drama.